I wonder how many of the people who are thinking of voting UKIP are aware that Farage’s party is openly calling for the end of the NHS? UKIP are not a maverick, anti-establishment, libertarian party. They are a bunch of right-wing, authoritarian Thatcherites – led by a public school educated ex-banker – who don’t like foreigners or homosexuals much. Reblogged this on gaelic craic. People should read between lines with this party, and I mean about each every member. Their idealogy and narratives. They are definitely not just the alternative vote. It’s sad that people are finally voting against the 3 main parties, only to choose a Fascist one. ukrap are Tories what did you expect. The media promoted ukrap to weaken the Tories to allow labour back into power. But the Tories might do a deal with ukrap prior to the General election. ukrap will even do a deal with Labour just to get their snouts in the trough. The media will now attack the monster they created. This should serve as a powerful anti-dote for any working or lower-middle class people seriously considering voting for UKIP. I think that is a spoof site, I posted a reply in the middle of April and it is still awaiting moderation! !, it isn’t UKIP’s policy and Paul Nuttal having met and spoken to him is staunchly in favour of keeping the NHS. Someone put that up and hasn’t bothered with the site since, the smear campaign continues. 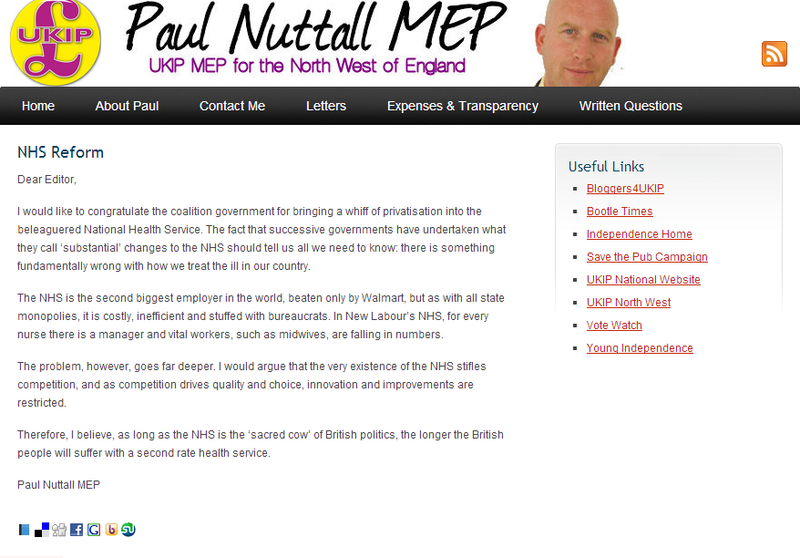 It’s a spoof site not Paul Nuttall, but you are correct about how the conlablibdum party are destroying the NHS. People should be aware that spoof sites like the one attributed to Paul Nuttall, do not reflect the views of UKIP or Paul Nuttall. UKIP is not fascist it is against the body that wants ever broadening territories, and ever closer union the two tenants of fascism. UKIP doesn’t want lebensraum. UKIP are taking votes from every political party and getting them from both Genders and every ethnic minority, the media are anti UKIP so what exactly is your point Carl Mason? Not really as it is not Paul Nuttalls site but a one post spoof site set up by someone whose only plan is to try to say Nuttall said something he didn’t. Possibly about as authentic as half of the emails I’ve been getting recently about unpaid bills, with a .zip attachment. However, the UKIP are really a one-trick pony – but that’s not a bad thing. If they ever get their way and we have a vote on the EU, British politics will return back to the normal parties, but beware Mr MP, you might have to work harder afterwards as you’ll have to run the country rather than sit back and rubber-stamp all of the legislation coming in from Brussels. UKIP have no intention of privatising the NHS, they want to run it along the same lines as Labour, ‘Free at point of Service’. I too follow Lucy Reynolds and find her quite eye opening, even pointing out that Labour actually changed rules to make it possible for Tories to bring in Privatisation! This would have something to do with the vast number of MP’s and Lords who have vested interests and were allowed to vote? UKIP are taking votes from all parties and some who haven’t voted for years. The literate ones at least! There are some who just don’t want to see what’s in front of them, either that or they are part of the problem! barry davies…please post ukips policies on the nhs…. That website is listed as Paul Nuttal’s information which he will have informed the EU with. That he hasn’t kept that website updated or edited it does not distract from the fact that that letter is on there and that there is no retraction by him on his website or anywhere else on the web is very telling. Reblogged this on Manchester MiSol. Ukip have not been honest, they want to make everyone pay 30% tax, even people earning less than 10k a year now who don’t pay tax at all!? Reblogged this on Translation Scrapbook. What will the UK electorate do when they’ve voted for UKIP next week ? Well, I think they’ll end up with about 25 UKIP MEPs, most of whom will do very little apart from try to destroy the parliament they’ve been elected to. After that, I think the UK will see UKIP as a one trick pony and desert them like rats on a sinking ship. Where will they go (before the general election in 2015 ? – back to the Tories. And what about Scotland – I think it will vote for independence in September, leaving Labour with less MP’s than ever (most Scottish MP’s are Labour…) This will be the end of any chance of a Labour government for another 10 years. Labour will have to re-invent itself, but what as next time, we’ve had New Labour and the public saw through that eventually. Fail. A huge number of people think the NHS needs to be shut down. It’s not a minority opinion. It is linked to from Paul Nuttalls pages on the European Parliament website. And has been up for five years. Are you just going to keep lying over and over, even though people are pointing your untruth out? The point is that the NHS is in a sorry state despite years and years of reform and even the Labour Party could not fix it despite throwing billions at it. Something needs to be done,, and it is quite clear that it is not good value for money. Just like the state school system, we are paying more than we should for the level of service we are getting, or to put it another way, we are not getting the service we pay for. It needs to be fixed and the lack of competition is of course a likely catalyst for the shoddy service we currently have. I welcome radical thinking to halt this terminal decline. Are you happy with the status quo? What would you suggest to fix it? I certainly hope that i the case! For too long the Scottish socialist vote as swung the balance in favour of Labour. There may be *some* people who agree the NHS should be shut down. It is far…far….far from being more than a minority opinion. Yes, there’s a lot of people who aren’t happy with how it’s being run. Not many would have it shut down. It has been, like pretty much every other facet of life, utterly corrupted by money. Pharmacuetical companies hold way too much power over it, and the buying practices are wildy dominated by the supplier side. Too many people with investments in lucrative but less effective drugs and treatments. Where private enterprise gets it’s teeth into it, it gets far less efficient, and for more expensive. Just like…ooo….say….everything that the government has ever privatised. A few people get rich, and the end-user loses out every time. Private companies are too ager to sacrifice effectiveness for efficiency in areas where effectiveness are more important. Plus vital infrastructure and services need to be able to run at a loss if necessary, and private companies can’t allow that. If you part privatise, you’ll find that the private side will effectively be subsidised by the public, with very little useful oversight. Which is exactly what is happening in the NHS. It’s been under such attack for a long time, and Labour are just as guilty as anyone. Would UKIP be any better? Well based on their general right-wing eagerness for everything to be private owned and run, I doubt it – even if this idiot Nuttall’s comments are truly his or whether that is the party line or not. UKIP proposes cuts in corporation taxes and the abolition of inheritance taxes. The abolition of inheritance tax would save taxpayers about £3bn a year. A flat rate of tax and the abolition of national insurance are advocated by UKIP, which it says will simplify the tax system, although it is unclear at what rate the flat tax would be set at. UKIP proposes “tens of billions” of cuts to taxation, along with a further £77bn of cuts to the public sector in order to reduce the deficit. The economic plans outlined by UKIP have been called into question by The Times, who have highlighted a “£120 billion black hole” in their spending plans. According to the party website, UKIP proposes directing the majority of health care spending to elected County Health Boards, making spending decisions directly accountable to the public locally; as well as dramatically cutting the Department of Health and bringing in professional procurement skills to reduce what UKIP says are the huge amounts of money wasted in procurement and resource allocation. In addition, UKIP proposes introducing a voucher system that will enable people to receive treatment outside of the NHS, replace non-clinical managers with matrons to run NHS hospitals and introduce free dental and eye checks. You could try following the link? Thanks, finally found it. However actually looking at UKIP’ policies and not the views of one member looks like they do not want to do away with the NHS. They do want to re-install matrons and revert back to non university trained nurses which would get my backing. Oh please Tom how often are you going to post this made up claptrap as being the truth even you must know by know that it is hokum. I’ve read the letter and re-read it but cannot see anywhere Paul saying the end of the NHS. Changes, yes, but not the end. The end of quangoes certainly to pay the way for better trained nurses and doctors and more of them – who can complain about that? And if you doubt about financial waste within the NHS – I could show you so much that it would be enough to fill a book. So, again please, exactly what has Paul said that’s so wrong? So that’s four doctors, ten nurses and four qualified scientific, therapeutic and technical staff for every manager. Usual UKIP lies. All they’re interested in is scare mongering, and divide & rule. Don’t fall for it. The NHS is the best British institution we have. Bar none. It’s absolutely historical how people can think that because UKIP are a CAPITALIST party that they are not going to act in a CAPITALIST way!! The problem with monopoly is the fact that there is nothing “better” or “worse” to compare it to! That is what this letter is outlining! “…the NHS no longer meets the country’s needs.” according to Lord Warner. Is it any wonder given Labour’s mass immigration policy! Ed Milliband in his conference speech said that if elected he will rebuild the NHS. He didn’t say HOW. He didn’t say where the money will come from and he didn’t say how he will cut immigration. He failed to mention he will be renaming it the IHS – International Health Service, which is the only way he can rebuild the over-stressed NHS and provide for the multicultural society we’ve become. He’d have no choice while we remain in the EU. “Labour will accuse David Cameron of selling off the NHS without permission and demand a halt to privatisation until after the general election. Apparently the sell-off has been going on since 2012 – http://welfarenewsservice.com/tories-1-5-billion-nhs-sell-scandal/ – But Labour still lies about it being UKIP’s aim to privatise / sell-off the NHS. If UKIP wins the General Elections, the NHS will have already been privatised or sold by Cameron in a 5-year agreement deal. Keep the NHS in public ownership. I will never ever understand why anyone would want to live in political union, where there’s no democracy, no pride and no self respect. If the lowlife looks on that as being fascist, so be it.